The Hoover MaxExtract 60 PressurePro is one of the best Hoover’s carpet cleaners. It has many features that allow this machine to produce advanced cleaning results. The Pressurized cleaning combats even stubborn dirt, including all kinds of pet stains. This machine is a widepath cleaner that saves your time and effort cleaning quickly and effectively. Let’s review the features of this shampooer and see why so many users are happy with it. The SpinScrub technology – The Hoover’s patented SpinScrub works as a set of counter-rotating brushes. 6 brush heads, each one containing 10 small brushes, penetrate deep into the carpet and lift up dirt and stains working from every direction. SpinScrub technology is one of the best ways of cleaning carpets that are available now, and it makes Hoover the leading manufacturer of cleaning appliances. The water jet is pressurized water that the Max Extract Pressure Pro 60 sprays on the carpet that helps to sweep away any dirt that the brushes alone could not remove. If you are a pet owner, you will surely appreciate this machine. Whether your dog sneaks into the house after playing in the mud, or your pet suddenly decides to urinate on the carpet, no more stressful emotions. Your Max Extract Pressure Pro 60 is able to deal with the stains within minutes. The high power – This 10 amp machine provides strong suction and strong water spraying. 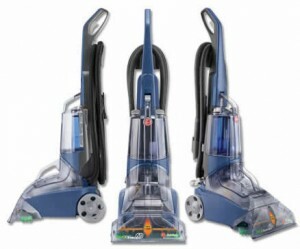 Although it is relatively light and is made for home use, its power is close to professional vacuum cleaners. The Widepath – This machine covers the path 13 inches wide. It is one brush head wider than usual Hoover’s SteamVac, which gives us additional 20% of cleaned surface. The more area your cleaner can cover at once, the less time you need to clean the room. This feature is especially useful if you have large areas to work on. Separate water tanks – Many users prefer shampooers with separate water tanks. This gives them an opportunity to empty and fill with water every compartment separately. This construction is much more convenient than the one where there is only one tank with two parts. A separate detergent compartment – separate compartment for detergent allows to use the shampoo as much as needed and save the residue for the next use. The Rinse mode – this is the feature most people wish to have in their carpet shampooers. It is always useful to be able to rinse the carpet one more time, removing the soap residue. Not only the chemicals left on the floor are bad for your health, but also the dirt sticks to the soup in the carpet. If you have pets or children that play on the floor, you would surely want to rinse the carpet thoroughly after cleaning it with the detergent. A hose and an upholstery tool – cleaning your stairs and upholstery is easy and convenient with this machine. The hose is 9 feet long and with the upholstery tool you can clean your furniture and even the car interior. The handheld tool is easy to attach and convenient in use. A cord – 20 feet long cord allows you to clean large areas without constantly searching for the closest outlet to plug in. A long cord is a useful feature that can save you time and make your cleaning much easier. The 2-year warranty – With this product you receive 2 years of limited warranty from Hoover. This is a reliable company when it comes to warranty, and we can be sure that along with the product, we’ll also receive great customer service. Forget long hours of waiting for your carpets to dry after cleaning. Thanks to the Dual V Nozzle technology and the hot air feature the carpets dry faster than usual. Even professional cleaning will not leave your carpet as dry as this machine. Dual V Nozzle technology ensures even strong suction all along the working area and as the result as much moist as possible is pulled out from the carpet to the dirty water tank. And also the strong blow of hot air additionally dries the carpet. The Hoover MaxExtract 60 users say that they are amazed how fast the carpets dry after cleaning. The Hoover MaxExtract 60 is built with your convenience as the first priority. It is easy to assemble and use. The overall construction is strong and durable. The water tanks are easy to empty and set back in place. There are separate tanks for clean and dirty water. The machine is easy to control, and it is maneuverable. The handheld upholstery tool is convenient and easy to attach and detach. This cleaner provides you not only with wide cleaning path but also with a good tank size. Hoover MaxExtract 60 is larger than some Hoover SteamVac machines, but it does not make it more difficult to use. On the contrary, it provides more cleaning in one path, saves your time and is extremely powerful. Excellent cleaning. The main advantage of this machine is, of course, its powerful cleaning abilities. Competing with the professional cleaning devices, it removes the most difficult stains and allows you to easily make large areas of carpet look new and shining. Using the SpinBrush technology and PressurePro feature it performs deep cleaning with the counter rotating brushes and the stream of pressurized water. Easy to use. This model has an intuitive design and is convenient to assemble. It is easy to remove the tanks and put them back in place. Also, the handheld tool is simple to attach and use. Widepath. This model cleans 13 inches wide area in one path. This is bigger than some other carpet cleaners can do. The Widepath feature saves your time making cleaning easier and faster. The Rinse mode and a separate detergent compartment. The Rinse mode is one of the features of this model that really stands out. You definitely want your carpet cleaner to be able to rinse as much as you need. However, not every shampooer in the market has this useful function, and this is where Hoover MaxExtract 60 excels. Brush heads have only one-speed option. This machine is heavier and larger than some other models. The package does not contain a powered SpinScrub hand tool; it contains only an upholstery tool. 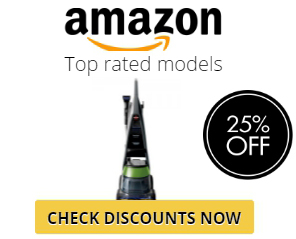 This one is more expensive than some other Hoover models. Consult the instructions. The manual has lots of information about how to use this carpet cleaner correctly. Although the design is quite intuitive, and the shampooer is easy to assemble and use, there still are some tips that have to be learned. If you have previously used some other Hoover’s products, you are familiar with how these machines work, but again, this shampooer has its own features and reading the manual helps to learn about them. One shortcoming of the manual is that it is one for MaxExtract 60 and a similar auto-rinse machine. With MaxExtract 60, you have to remember to manually turn on the rinse mode when needed. Be careful when assembling the cleaner. Make sure that everything is set correctly in place to avoid leakages. Do not apply too much unnecessary force to connect the parts, risking to break them. Remember that it should be easy to attach and remove; this especially concerns the upholstery tool. Use a compatible detergent. We recommend using Hoover’s detergent with this machine. Other carpet shampoos may produce too many bubbles or be not acceptable because of some other reason. A little bottle of Hoover’s detergent comes with the package, but it’s only enough to clean the carpet in a small room. If you are planning to work on more carpets soon, you may want to order a big bottle of Hoover’s detergent together with the machine. Many customers prefer the Hoover Platinum Collection of the detergent. This will come in handy, especially if you own pets, or your carpet is dirty and needs deep and powerful cleaning.